Boom. That hit me like a ton of bricks. If you thumb through your 1986 Small Catechism (the actual catechism: Commandments, Creed, Our Father, Baptism, Confession/Keys, Lord’s Supper, Daily Prayers, Table of Duties, and Christian Questions with Their Answers), this phrase (or a form of it) appears seven times by my quick count. “As the head of the family should teach it…” It appears at the beginning of five of the six Chief Parts and in two other places. If a man considers himself to be a confessional Lutheran, this phrase really ought to shape the way he practices his Christian faith. In the words of the Small Catechism, what does this mean? First and foremost, this means that the Small Catechism is a book for the home. If the first time a young man sees the Small Catechism is at his congregation’s confirmation class informational meeting or at the first session of said class, this part of the Small Catechism has already been neglected. In this example, the head of the household has abdicated his God-given vocation of the bishop of the home and abdicated it to the bishop of his parish. Now, we certainly pray that all our Lutheran pastors are capable teachers of the faith as contained in the Small Catechism, especially since bishops are supposed to be “apt to teach (II Tim. 2:24).” But if the first time this young man see the catechism, he’s already behind. Our young children need these texts, just as much as 12, 13, and 14 year olds need them (just as much as heads of households need these texts). Now, you might think, “Here’s a pastor looking to make his job easier when it comes to confirmation.” Admittedly, you’d be right to think so. It would be easier to approach the task of teaching a class on the catechism if the texts were familiar to the student (in a perfect world, they’d already be memorized, so more and in-depth instruction can replace the threatening and cajoling pastors often have to do to get students to do their memory work). Yes. I will admit to this. However, it’s also a Scriptural idea, too. As if that’s not enough, a few chapters later, God says again, “You shall therefore lay up these words of mine in your heart and in your soul, and you shall bind them as a sign on your hand, and they shall be as frontlets between your eyes. You shall teach them to your children, talking of them when you are sitting in your house, and when you are walking by the way, and when you lie down, and when you rise.” Now, when God says something, it’s important. But when God says the same thing twice—truly, truly—we should be listening. All of this has made me feel incredibly guilty. In fact, since I’ve been a pastor, I’ve been to two conferences that have had some focus on at home catechesis that have induced this feeling. My children are young (4, 2, and 8 months), and it’s hard to do what God commands me to do—not as a pastor, but as a husband to my wife and father to my children. It’s hard, and I fail miserably. I am certain I’m not alone in this. How easy is it to forgo family devotions because of a busy day or week? Vacations are especially tough, because it’s hard for us to justify bringing a stack of books with us on the road. If you have small children, you know how much “stuff” they need. How easy is it for a week of not doing devotions turn into a month? Oh, wretched father that I am! Who will deliver me from this body of death? We (including me!) need to repent and believe the Gospel. Now, what I’m going to advocate isn’t a magic bullet. I don’t claim to think by my doing (or your doing) that we can save the Missouri Synod or the Church catholic—that’s Christ’s job. I can’t even promise that it will keep your children in the one true faith—that’s the Holy Spirit’s job. I’m also certainly not unique in my recommendations—I don’t like innovation; it’s too much work! But I will promise that by doing these things I’m going to recommend, the Holy Spirit will be at work in the midst of your family, because the Spirit works through the Word (Romans 10 and AC V). Do devotions with your family—your whole family—every day. Set a time to do it. Stick with it. Shut off the TV. Don’t do anything else while you’re doing your devotions. Use a set form with your devotions—a liturgy, if you will. Lutheran Service Book has some good options on pp. 295-298. Routine with kids is important. Heck, routine with adults is a good thing. When you can’t lug all your devotional books with you, if you have the liturgy with you in your mind, you don’t necessarily need a book. This is a good thing for parents on Sunday mornings, too, who can’t hold a hymnal while wrangling their children in the pews. Sing a hymn. Don’t just skip it because you don’t have a pipe organ in your home. There are some options for music in CPH’s catalogue, but this isn’t necessary, either. My family sings a capella (without music), and it usually works pretty well. Nothing leads a human voice better than a human voice. I’d also suggest that you try to memorize hymns. Again, if you know hymns by heart, you don’t have to bring your hymnal with you when you travel! Read the Scriptures and talk about them. Right now, we use CPH’s Story Bible, which comes furnished with questions. This even helps kids with reading comprehension! Most importantly, though, faith comes by hearing (Romans 10). Pray the catechism. President Harrison recently translated Martin Luther’s “A Simple Way to Pray” and put it in a booklet, and this is a good place to go. With children as young as mine, praying the catechism right now means that we simply says the 10 Commandments, Creed, and the Lord’s Prayer. At the end, we also say Luther’s evening prayer. We do this every night, and the repetition has paid off. My kids know these primary texts. Teach your kids to make the sign of the cross and fold their hands. Little hands are busy. If they learn to do these things, there will be less fidgeting and poking and hitting of siblings (well, that’s my hope). This may seem intimidating at first. It may seem disorganized. For us, we’re trying to figure out what works best for our kids. I have plans to work up to perhaps praying Vespers at home, but we aren’t there yet. Devotions with your family will change shape as your family grows and ages. Like I said, though, these are suggestions. But teaching your kids the faith isn’t a suggestion. It’s necessary. Not because you, by your doing, are able to work up your faith into perfection, but because it’s God’s Word. He’s the One at work. As St. Paul reminds young pastor Timothy, “Keep a close watch on yourself and on the teaching. Persist in this, for by so doing you will save both yourself and your hearers (I Tim. 4:16).” And what a joy it is to sing, pray, and confess together as a family. I rejoice that God has given me this task of teaching the faith to my children! Associate Editor’s Note: With this post Pastor Jordan McKinley joins the regular crew of writers at BJS. There will be some more changes in authors over the coming months. Here is a little more about Pastor McKinley. Rev. 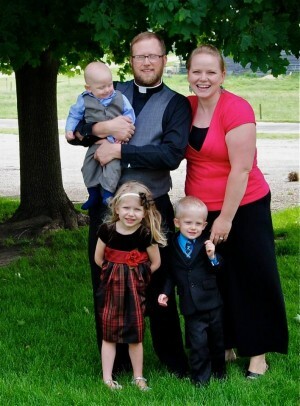 Jordan McKinley is the pastor of St. Paul Lutheran Church in Bennett, IA, and St. Paul Lutheran Church in Stanwood, IA. He’s a 2012 graduate of Concordia Theological Seminary in Fort Wayne, IN, and a 2006 graduate of Ball State University in Muncie, IN. He is the husband of one wife, Andrea, and the father of three (Naomi, Collin, and Theodore). Though he has a deep and abiding love of all things Star Trek, he will not likely be writing any theological treatises in Klingon. Rev. Jordan McKinley is the pastor of Trinity Lutheran Church in Vallonia, IN. He’s a 2012 graduate of Concordia Theological Seminary in Fort Wayne, IN, and a 2006 graduate of Ball State University in Muncie, IN. He served his vicarage at Our Savior Lutheran Church in Pagosa Springs, CO, and served from June 2012 to August 2015 at St. Paul Lutheran Church in Bennett, IA, and St. Paul Lutheran Church in Stanwood, IA. He is the husband of one wife, Andrea, and the father of three (Naomi, Collin, and Theodore). Though he has a deep and abiding love of all things Star Trek, he will not likely be writing any theological treatises in Klingon. Great article! I confess I failed in this as well. My sons are grown now. I pray every day for the Holy Spirit’s intervention to correct the effects of my error in their lives. Indispensable point about the use of the Catechism in the home. This could be the single most important matter affecting the vitality of believers today. No better or easier way for a pastor to earn big points with other pastors and the women who make up the majority of his congregation than to complain that every man isn’t a pastor, theologian, biblical scholar, perfect head of household, and all around amazing Christian man. Lance, would you mind clarifying what you are getting at with that comment. Thanks. Not sure I follow there, Lance. Catechesis is primarily a function given to parents for their children. Pr. McKinley made that point clear from the testimony of Holy Scripture, and the witness of our own Catechism. This didn’t sound to me like a point scoring exercise, but a call to faith and repentance. Every Christian man and woman, parent, or child, is at the same time sinner and saint, so no one is expecting to see perfection in the works of any. However, the call of Scripture is to be holy, as God is holy… the Law in all its terribleness. Even as fathers take refuge from the consequences of the Law due to them for their neglect of their catechetical duty, through the grace and mercy of Christ’s Gospel absolution, their repentance and faith urge them to return to their duty with a new and inspired vigor. This particular sin of parental failure to catechize their children is epidemic, public, and scandalous… and hence worthy of public preaching and open rebuke. Hat’s off to Pr. McKinley for doing so. There are plenty of great dads who don’t sing hymns at home. There are plenty of great dads who teach their children about their faith and about life as things come up without doing daily devotions. There are plenty of great dads who know how to rebuild a transmission or build a staircase but are tone deaf or just not that bright when it comes to book learning. In short, there are lots of great dads who aren’t seminary educated pastors. It’s also worth noting that the more “in-depth instruction” desired by the clergy is generally the time to go into this or that hobby horse that a given pastor has. It’s the time to explain why the Fort Wayne seminary is better than the St. Louis seminary (or vice versa). It’s an opportunity to push agendas and a forum for bookish, intellectual academics who dream of turning the whole world into a college/seminary campus to play professor rather than pastor. And of course there will be single parents and others who need some help. Just like everyone can’t be homeschooling superstars and might actually benefit from having a Lutheran school to send their children to. The head of household should raise his children and teach them. Absolutely. But is helping parents do a better job in their vocations as mother and father the goal? Or is it something else? I just conducted a funeral for a retired Air Force officer whose family was living in England when the kids were the “normal” age for confirmation instruction. With no Lutheran church around, he instructed his children using Luther’s Small Catechism, and when they returned to the U.S., his children were confirmed by the local pastor. How encouraging this was for me to hear of someone taking their parental, fatherly duty of teaching the faith seriously. With respect, I think you’re making a case against something no one is arguing for. The Catechism is just a few pages of basic Biblical stuff. 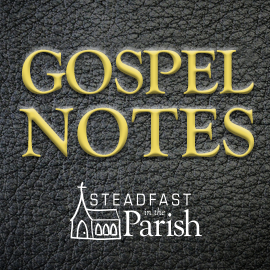 Teaching our kids the Ten Commandments (God’s Law), the Apostles Creed (God’s Gospel), the Lord’s Prayer, and the meaning of Baptism, the Supper, and Absolution is basic stuff. This is not seminary level instruction, nor is it some theologian’s hobby horse. This is basic Christian literacy. If the father is illiterate on these basic matters, he should seek education from his pastor… with great haste and vigor. I don’t think the method by which we teach our kids the fundamentals of the faith is that much of a big deal. The Deuteronomy texts provided by Pr. McKinley above, refer to the constant conversation of parents with children, as they teach them the Word of God. Does that have to be hymns and specific devotional times? Nah. But it should be the regular conversation of the family. When parents fail to teach their kids the faith, they emerge as ignorant and easily deceived people who can’t tell the difference between their Lord’s Word and the cacophony of false words preached by liars, false prophets, ignorant errorists, or the devil himself. What father wants that on his conscience, to have turned his kids over to the world, when he could have spent his time giving them Jesus? Again, this isn’t calling fathers to be systematic theologians. This is telling fathers what God is telling fathers: raise up your children in the way they should go; teach them the Word of the Lord that saves them; give them Jesus. My dad taught me a lot of things about cars and construction, too… but may God bless him forever, for having given me Jesus by His Word. Your comments are veering on the category of “troll”. Please stop. Thanks for reading my article. I’m not sure where you got the idea that I was trying to score some points with other pastors and women. I’m not interested in scoring points with other pastors (mostly because I don’t want to hold any elected office), and the only woman I want to score points with is my wife. Sorry if it came off that way. But as to your point about great dads who don’t sing hymns–As I said, singing a hymn was a suggestion. Our hymnody is a priceless treasure that confesses the saving work of Jesus in a way that we can carry with us in our hearts and on our lips. But this wasn’t your main disagreement (as far as I can tell). It seemed you were more concerned that I was calling all dads who don’t lead devotions at home bad dads, because they’re better at fixing cars. My biggest concern is that fathers are supposed to teach their children the faith. It’s in the Bible: “Fathers, do not exasperate your children; instead, bring them up in the training and instruction of the Lord (Ephesians 6:4).” Great dads do teach their children lots of things. I’m working on teaching my kids some Klingon phrases and why Star Trek is better than Star Wars. But I’m commanded by God in His Word to teach my kids the faith–as are all fathers. It’s not because I have theological hobby horses that I want to rant about. It’s because I want our kids to know Jesus and have eternal life in Him. I ask that you avoid trying to discern my motivations in the future. Mind reading scares me. Jay, as I said, I’ve fallen short in this, too. I give thanks to God that my kids are young, and I have more opportunity to teach them the faith. I pray that you are given opportunities to speak with your children (even if they are grown) about the faith. You’re still their father, and you still have responsibility for them. But I also want you to know that your shortcomings are forgiven for Jesus’ sake. Thanks be to God! Not a pastor, but a layman here, and a step-father of sorts. Yes, it is the duty of a Lutheran father to teach his children the Small Catechism. That has nothing to do with hymn singing or being good at book learning. If you cannot comprehend the Small Catechism well enough to teach it, then you need to brush up on it, preferably with help from your Pastor. Now, given your stance and statements and objections, I sincerely doubt you’ve ever read the Small Catechism. I also doubt you are a Lutheran of any shade. Please explain to me the objection to a father being able to know the 10 Commandments, Lord’s Prayer, and the Apostle’s Creed. Hmmm, Lance has some valid points, why do you say he is “verging on a troll”? He has a past here at BJS and his opening comment is much the same as before. The warning is necessary. Largely because his comments are red herrings having nothing to do with what Pastor McKinley actually wrote, the Scriptures he cited, or what the Catechism says. Where there is fallacy, there is trolling. When you say “Teaching our kids the Ten Commandments (God’s Law), the Apostles Creed (God’s Gospel), the Lord’s Prayer, and the meaning of Baptism, the Supper, and Absolution is basic stuff.” I think you are definitely correct. When you speak of “constant conversation of parents with children, as they teach them the Word of God” you sound very reasonable. And the original article above did as well. For the first 5 paragraphs. Then beginning with “Now, you might think” things turned from fathers doing what the Small Catechism says to a different set of topics. Fair point. As other commenters have noted I reacted as much to the context of this piece as to what you wrote. In addition to the comment from Jay which you graciously responded to I would offer this example from another thread where this article has been shared elsewhere to demonstrate what I’m talking about. From a nice church lady: “If fathers would do this there would be less divorce and his children would rise up and call him blessed”. I think fathers reading scripture with their children and talking to them about Christianity, life, their problems, their hopes, and much more is wonderful advice. And I think the Small Catechism itself tells fathers what they should be doing in terms of catechesis at a bare minimum (as the first half of your article makes clear). My objections are largely to the second half (which I really do think paints an unrealistic picture for most parents who aren’t clergy) and to what people take away from posts like this, despite the disclaimers you included. Perhaps it is wrong to blame you for that. I have read the Small Catechism. I have no objection to the expectation that a father know those things and teach them to his children (in addition to praying with them and talking with them about Christianity and about life). Understood. Having replied briefly to the questions/challenges/remarks directed at me I will cease. I’ve found Higher Thing’s Reflections to be very useful. There’s a page in there for daily devotions using the Small Catechism, and uses the same Daily Lectionary from the Lutheran Service Book. You can also order laminated packs of the Daily Prayer for Individuals and Families (from the Lutheran Service Book, The Lutheran Study Bible, and Treasury of Daily Prayer)…or read it out of the book. I really think we are past due on a translation of the Small Catechism in Klingon. One Trekker’s humble opinion. On a more serious, and important, note: The Treasury of Daily Prayer http://www.cph.org/p-11350-treasury-of-daily-prayer-regular-edition.aspx?SearchTerm=treasury%20of%20daily%20prayer is a wonderful book that can limit the number of books you have to take with you. Even better, is the CPH iPhone/iPad app https://itunes.apple.com/us/app/praynow/id375144431?mt=8 that is the entire Treasury of Daily Prayer, but fits in the phone you are already taking with you or on a 9 oz iPad. Also, it is only $9 vs. the $50 for the book. I have TDP on Kindle and the printed edition with all the cool bookmarks. The daily section is very good but it’s difficult to flip back and forth to the different sections on a Kindle, much like the Bible or Concordia on Kindle. I still have to use a real Bible in Bible class because it takes too long for me to look something up. The iPhone/iPad have a function where you can set it to automatically insert the day parts (Propers) into the Matins/Vespers/Compline & Orders of Daily Prayer. That is cool. A feature similar to the Lutheran Service Builder. Many laymen confuse Luther’s Small Catechism with the Explanation to Luther’s Small Catechism by Schwan et. al. 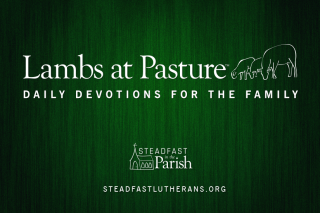 Parents can teach Luther’s Small Catechism without a theological degree. However, I believe that even at Luther’s time, the pastors followed up the parents’ teaching with further instruction. JB, I think this was a little strong. And while I think all the suggestions in the topic were good, I doubt most families do all of them. My folks worked long hours six days a week, but someone had to be sick to miss church and Sunday School. Sometimes that example is the most lasting lesson. Excellent observations. Treasury makes all this incredibly easy and as noted above, PrayNow takes it a step beyond easy. You’ll always have the daily readings, hymn, prayers and even orders of service in your pocket with your iPhone or your iPad. My wife and I like using the physical book when we’re at home, but for travel we just use our iPads or iPhones. I stayed overnight on one trip with Kantor Beethe and was delighted to see how his family (with small ones) begins the day with breakfast and Treasury. P.S. A friend of mine recently went to Holy Land. At one point they were visiting a site and she asked if she could pray. It was the place where by tradition our Lord’s torture began. She pulled out her iPhone and read from PrayNow the daily prayer for Friday (which always commemorates the Passion). Everyone thought it was so wonderful, but even her pastor (!!!) hadn’t even heard of the PrayNow app. She encouraged them all to get it! There’s one more thing you can do after establishing the habit of daily prayer and learning the catechism. I have found it very helpful to take 3-6 minutes per day to read or recite one chief part. It doesn’t take long, but it helps a lot in hanging onto the words.